Ade Akinbyi and Bruce Dyer have both completed moves to Sheffield Utd who are second in the Championship. 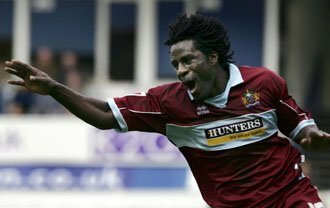 Akinbiyi joins from Burnley for £1.75m and has signed a three and a half year deal. Dyer is contracted until the end of the season. Warnock had offer £2m for Cameron Jerome but City held firm and refused to sell. Jerome has 13 league goals this season to Akinbiyi's 12. "Ade is a record signing for me and I'm ever so pleased," said Warnock. "We're looking at quite a few years ahead as well. He's just the right type of lad I think we need at the club - which is already a very good squad." "Bruce has a contribution to make and with the likes of Danny Webber out injured and Brian Deane stretching his hamstring the other day, I felt we were very thin on the ground. "And in case there had been complications with Ade, I wanted Bruce." Two weeks ago Burnley came to Cardiff above the Bluebirds in the table. Now they have been left trailling after two defeats and have sold their top scorer. Isn't that the sort of thing that happens at Cardiff City? In other Championship news Leicester City have sacked Craig Levein. Not content with losing to us last Saturday, the Foxes then went won to a 1 - 0 defeat at Plymouth on Tuesday night. That was curtains for Levein who left the club on Wednesday.